Welcome to Week 7 of Pregnant with Style feature, a weekly low down on the cutest and little known maternity brands. Boden is a British brand that started out as a small menswear company only to grow into big, bright and beautiful brand with a full range of clothes for everyone. The one thing that comes to mind when I think of Boden is COLOR. COLOR and PATTERN! Their styles are incredibly distinguishable from anything else we are exposed to here in US. It’s like Benetton grew up and discovered luxury. I’ve been in love with their strict shapes, classy designs, warm styles, tantalizing colors and mind-bending patterns since the first day I visited Boden website. Recently, however, I discovered that Boden carries a small, but equally bright and happy maternity line. Using the same funky patterns and bright coordinating colors, Boden makes maternitywear fun again! Check out Boden maternity line here. And if you like your man looking prim and proper and classy and most importantly HOT, visit the men’s section. Boden started in menswear, so they know a thing or two about how to make your man look dashing. Too bad we don’t have much use for yummy sweaters and trendy coats here in Florida, but I know now where I am going for an outfit or two when things get really chilly here. Btw, I got a really good kick out of Boden’s “Dad Dancing” video. I loved it so much, I watched it three times, showed it to hubby and just had to post it here. I’m sorry, but if my dad looked this hot, I’d let him dance around all day long. So onto the actual review of one of Boden’s tunic/dresses…. 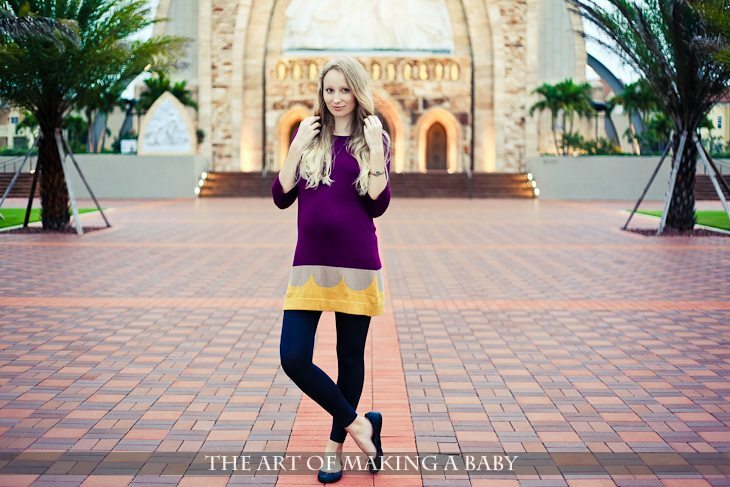 I chose the Fun Knit Tunic for the few months of cold-ish weather in Florida and the first time I put it on it really paid off 🙂 I got it in a size or two larger than I needed to accommodate my preggo belly and it worked out perfectly. I wore it with black leggings and flats for a cute and comfy look and my husband and I went to a neighboring community to take some maternity style photos. During the day I was comfortable as long as the sun wasn’t shining, but by the end of the night, poor Andrew was freezing his bum off and I was warm and toasty. The funny part was that Andrew was lukewarm on this tunic when I was looking at it online, but when I got it and put it on, he wouldn’t stop commenting on how cute it looked. I loved the simple design with a little fun colorful flare at the bottom. It can be worn with leggings, pants and I really adore the way it looks with bare legs and boots on (yum!). Is this dress cute or what? I’m so getting it for Alexis when she’s a little older to match my tunic. I’d love to hear what you think of my new tunic and Boden’s styles and what other maternity brands surprised you with the style and quality. Disclosure: I received the above mentioned product for free. All opinions are 100% my own. This is my first time stopping by your blog, loved it. Cute tunic Elena! I love Boden too. I’ve been getting mini boden catalogs in the mail since before I was even pregnant. I would be dreaming of the little baby girl (I hoped!) that would one day wear those clothes! Too fun.